Motherood is something so natural to human kind and yet it can shake us in many shapes and forms. It is something that comes and we just learn on the way as we go with support and help with those around us. Well, if it is natural why can it be so hard to figure out what to do? Why some of us can struggle at the start or even later when our little ones are no longer that little? Why aren’t we sometimes sure about what to do even there are so many books, articles and we are being bombarded with information? Well the thing is it is never black and white and there are tons of opinions out there. However as you go and your baby is growing, you learn and you find a way. There are many lessons that you will come across and you will find out some incredible and some less incredible things about yourself. So here is more about what motherhood taught me and showed me. Love – I heard that before so many times from people around us, from my own mother … the love for your child is unconditional and the type of love you can only experience once you are a parent. It is that sort of love that even if you get few hours for yourself you keep scrolling through pictures of your child when they aren’t with you (Yep and never thought I would be that person). However, it does not mean you will click with your baby straight away. I heard so many stories when women felt the bond right after the birth but I didn’t. It took me few weeks so it is ok when you do not feel exactly how the world expects you to. Strenght – You will find out you are much stronger than you ever knew. Before I had Liam I thought I am tough and I can work hard however motherhood is a new level of everything. It is not just having two jobs and work 14 hours a day. It is non stop and different level of responsibility. There were times when I had 2 hours of sleep few days in a row, I had probably poo in my hair and on my face and I was trying to write and create content and also cook dinner for my husband and I was on the edge of losing it. There were times when I thought if somebody isn’t gonna come through the door and help me I will faint but I made it. I always made it and I am proud of it. Looking after yourself is more important than ever – You honestly will have the most surprising moments that will be nasty, filthy and can come out of nowhere. I had that just yesterday walking from a meeting wearing Gucci tights, cute designer bag and feeling good and then your child gets sick and it is everywhere his clothes, your clothes, buggy but then I was like at least I look good and he is ok. I laughed it off. However, it really has been researched that how you look really affects how you feel. If you workout, look after your skin and wear nice clothes it increases your confidence and everything around that. World just seems nicer with a cute lipstick on. It is Ok to ask for help – It is normal that you need time off, you need another pair of hands and it is fine to ask for help. To be fair I still work on this. Partially I feel guilt and I feel obliged to a person that helps me and partially I am a control freak. I have always felt I prefer to do things on my own. I know this is wrong as we all need help but that is my own personal issue to be fair. However, just because I have issues with it doesn’t mean you should have so accept help that is offered by family or friends. You need it and you need time off as we rarely get that. Everything is just a phase – I cannot count how many times I have heard this and it is true. It helps so much to get through the tough times whether that is issues with breastfeeding, first illness, colic, tantrums and every other issue you will probably have to face. You will always get through it and then find a way and then just when you feel you have mastered it something new appears. However, it is all ok as it just a phase. Even when Liam will have girlfriend issues I will have to accept it as a phase LOL. Motherhood is hard but wonderful and it will teach us many things along the way but remember you are strong, stay away from discussion forums or asking too many people for advice as it can get very confusing. You just have to listen to your intuition and go with the flow. You got this one. Materstvi je neco, co je nam prirorezeneho a presto muze otrast v zakladech kazdou z nas. Je to zkratka neco, co se ucime behem celeho procesu za podpory naseho okoli, rodiny a kamaradu. Dostavame lekce za pochodu a nekdy jsou velmi necekane. A tak se sama sebe obcas ptam, kdyz by to pro nas melo byt vse tak prirozene, proc se tak casto ztracime a nevime jak na urcite veci? Ja jsem treba mela krusnejsi zacatky a nevedela si rady a vsechny ty informace kolem mi akorat davaly zabrat. Problem je v tom, ze to nikdy neni cerne a bile a nikdy nic neni spravne a spatne a clovek se v te zaplave informaci proste ztrati. Pozdeji vsak zjistite, ze nejlepsi je spolehat se na vasi intuici a ze jak dite roste, ucite se svym zpusobem. Ceka vas tolik lekci a postupne se o sobe dozvite nove a nove veci. Nektere jsou super a jine uz mene. A tak se s vama podelim o to. co jsem se zatim v materstvi naucila a zjistila ja. Novy typ lasky – To ze materska laska je uplne neco jineho a nepopsatelneho jsem slysela tolikrat, ale clovek na to opravdu prijde az se stane rodicem. Je to nepodminena laska, ktera nema hranice a pro sve dite bude kazda mama dychat do posledniho konce. Je to takovy typ lasky, ze i v momente, kdy vite, ze potrebujete byt sama a podari se vam to, tak si prohlizite roztomile fotky sveho ditka (a nikdy bych nerekla, ze budu patrit do teto skupiny). Neznamena to, ze tyto pocity vam naskoci od prvniho momentu. Ja to tak nemela a nechapala jsem co je se mnou spatne, ze necitim materske pouto od prvniho dotyku hned po porodu. Hormony se mnou cloumaly jako silene a prestoze spousta zen o tom asi moc nemluvi, ja jsem zacala materske pouto citit asi az od tretiho mesice. Od te doby se hodne zmenilo a moje laska k Liamovi roste a roste kazdym dnem. Mam obrovskou silu – Diky materstvi jsem zjistila, ze jsem strasne silna. Vzdy jsem o sobe vedela, ze jsem dric, ze hodne vydrzim, ale byt mamou je uplne neco jineho. Mela jsem stavy, kdy jsem mela pravdepodobne hovinka ve vlasech I na obliceji a prezivala asi na dvou hodinach spanku denne a do toho jsem se snazila psat, vydavat nejaky obsah, varit veceri, prat a vse kolem a presto jsem to vzdy vydrzela. Obcas jsem citila, ze jestli nekdo nevkroci do naseho domu a nepomuze mi, ze se sesypu a vzdy jsem to vydrzela. Je to uplne jina zatez nez mit dve prace a delat treba 14 az 15 hodin denne a presto to vzdy vydrzite. A jsem na sebe za to pysna. Je dulezite se o sobe starat – V materstvi vas cekaji prekvapeni a velmi casto ne moc vonave. Prekvapi vas tak, ze nestacite rict svec. A zrovna to jsem zazila vcera. Sla jsem si ze schuzky, ktera dopadla dobre, citila jsem se skvele na sobe puncochy od Gucciho a hezkou designerskou kabelku a v tom hodil Liam takovou savli a ze to bylo vsude…moje obleceni, jeho obleceni kocarek, ale byl v poradku a to je hlavni. A tak jsem si dal kracela ve svych pozvracenych Gucci puncochacich a vlastne se i zasmala, ze se ani nic nestalo. Takove momenty by nemely zadnou z nas zastavit a rict si, ze stejne mi to dite zaspini, pozvraci, pokadi. Opravdu je dokazane, ze kdyz je clovek upraveny, vse se v jeho mysli meni, zvysuje se sebevedomi a citite se lepe. Ja to rikam porad, ze vse jde lepe s hezkou rtenkou. Je to v poradku, kdyz mate pomoc – Vsichni potrebujeme obcas pomoc a v dobe, kdy mate male dite tak asi vic nez kdy predtim. Ja mam trosku takovy problem, ze kdyz mam pomoc, citim se provinile. Pokazde se ptam, zda to tomu cloveku nevadi a tak nejak s tim bojuju. Ale obcas je to treba, takze pomoc neodmitejte a neuzirejte se jako ja. Je to normalni, ze chcete mit cas na sebe a treba si cist, zajit si zacvicit nebo proste vypnout. Materstvi je narocne, ale zaroven je uzasne a naucite se tolik veci, ktere by vam zivot mozna nikdy neukazal. Idealni je se drzet daleko od skupin pro matky, diskuznich for a take se ptat hodne lidi na nazor. Vsechno toto akorat mate mamam hlavy. Nejlepe je poslouchat svou intuici a ridit se pocitem. Proste to vzdy vsechno zvladneme. It would be hard to count how many times I have heard the phrase ” You don’t know what love is until you have a child. Pure and unconditional love forever”. And until last August I did not know what people were talking about, however when my son Liam was born it finally clicked. I felt the type of love that is hard to describe with words. I must admit, Motherhood is one of the hardest jobs I have ever done and I say it to all mums out there! We deserve a medal for being mums, we should be put on a pedestal and be worshiped. I know I have only been doing this “job” for few months and I still have a lot of years ahead of me but am now experiencing all the first moments with Liam. It seems we have done so much together already – first Christmas, first snow, first flight, first fashion week and so much more. I took him to our first fashion event when he was only 12 days old and that will always be remembered. There is one special day approaching fast though and that is Mother’s day. This year it will be myself who sees their child coming with a bunch of flowers, presents and big smile on their face. Obviously for the next few years Liam will need my husband’s help. I remember when I was little our dad would help us with buying presents for mum (or in other words paid for things we pointed fingers at). And as my husbands has learnt over the years he knows I love to pick my own presents (I know not very romantic but it saves time and no need for exchanging things afterword’s). I also remember so clearly way before I got pregnant that I used to say to my other half ‘do not ever let me to stop being who I am when I have a child’. I was scared of the image of being a tired mum that forgot she loved fashion, heels and great lipsticks. Sometimes it can be hard but I am so happy I am managing to juggle everything. Honestly, when you think about it women do so much. That’s why I was so pleased when PANDORA approached me to be part of their #Do campaign, which is all about celebrating female empowerment. This got me thinking about all the things I still do as a mum: I still love running my blog, still wearing fabulous clothes and even when I feel very tired I try to put on at least a bit of lipstick. It makes me feel good when I am pushing the pram and have had more than a few sleepless nights. Women are strong creatures and I know we can do it all, even when at times it feels really hard. 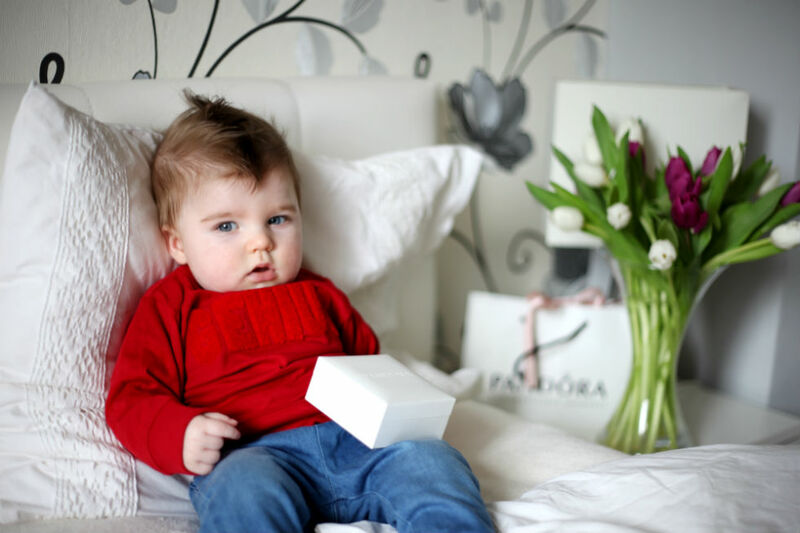 My first Mother’s Day is really special this year, so I have chosen some special pieces from PANDORA to remember it by. There is nothing nicer than to look at gifts you received and have them connected to a special memory. I want to be able to wear these things forever and what better to choose than an iconic PANDORA Essence bangle with some gorgeous charms. I can sometimes be very classic and traditional when it comes to jewellery, so to compliment this I went with the Essence generosity and Essence love charm. I love to mix different tones of jewellery, so combined the rose bracelet together with silver which went perfectly. I am also a huge fan of cute necklaces and discovered the stunning and symbolic Family Tree necklace – a great piece to be gifted on this special day. I just know I will be able to wear all these items with anything- from my work white shirt to distressed jeans and simple t-shirt and that is what I am all about when it comes to style- timeless elegant and versatile! Myslim, ze by pro me bylo tezke zpocitat kolikrat jsem slysela pred tim nez jsem se stala mamou tuhle vetu: ” Nevis, co je skutecna laska do te doby nez mas sve vlastni deti”. A do te doby jsem to nejak nechapala. Dnes uz tomu rozumim a zcela s tim souhlasim. Je to bezvyhradna laska, ktera se tezce da popsat slovy. Materstvi je ale zaroven nejtezsi prace, kterou jsem kdy delala a kazda mama si zaslouzi obrovskou medajli. A myslim, ze ani tatinci to nepochopi. Jenom mamy. I kdyz mam za sebou pouze sest mesicu, teto tezke “prace” tak mam pocit, ze toho mame za sebou tolik. Prvni Vanoce, prvni snih, prvni modni udalost a Fashion week. Liamka jsem si vzala na prvni modni akci, kdyz mu bylo dvanact dnu. A na to nikdy nezapomenu. Byla jsem pekne na nervy, hormony se mnou cloumaly, ale nakonec jsem si to uzila a mam na to krasnou vzpominku. Zive si tak vzpominam, ze dlouho predtim nez jsem otehotnela jsem manzelovi rikala, at mi nikdy nedovoli, aby me materstvi zmenilo. Myslim v tom slova smyslu, ze se nebudu o sebe starat a ze zmaminovatim. To byla moje nocni mura, ze bych se mela vzdat mody, krasnych botu a oblibenych rtenek. Je to narocne, ale jsem rada, ze se snazim, abych zvladla vsechno. Kazda takova vec mi totiz udela radost. Kdyz mam za sebou neprospanych noci a tlacim kocar, tak dat si na rty novou rtenku me zase povzbudi. Zkratka to jde. A tentokrat nas ceka nase dalsi prvni udalost a to den Matek. Tento rok a i ty dalsi jsem konecne ja ta druha, opevovana a obdarovana a Liamek ten, kdo mi s usmevem na rtu prinese darek ci kyticku. No vzpominam si na detstvi, ze obdarovaval (jinymi slovy platil) spis tatinek a ja a sestra jsme tak mozna ukazaly prstem, co si pro mamku predstavujeme, ale to nevadi. Muj muz vi, ze stejne se me musi vzdy zeptat, co presne chci. Ja radsi neco co opravdu chci, nez spatne prekvapeni. LOL A tento rok je poslu pro darek do Pandory. Mam rada, kdyz se po case na veci podivam a mam je spojene s prilezitosti a vzpominkou a to si preju prave letos ke svatku matek. A taky je krasne, kdyz je za darky i symbolika. Napriklad tento privesek rodinny strom je krasna symbolika a k teto prilezitosti jako delany. A jelikoz mam rada klasiku, tak nesmim zapomenout na ikonicky naramek a tyhle dva koralky – Essence generosity a Essence love. Skromnost mi moc nejde co? Kazdopadne se tyhle kousky budou hodit k tolika vecem, at uz treba k vice formalni bile kosily nebo kozene bunde a roztrhanym dzinum. Mam rada veci, ktere se daji dobre kombinovat a neomezuji me. At uz si prejete jakykoli darek, snad bude Den Matek a i ty dalsi svatky nezapomenutelne.